The Arts DANCE & MUSIC Articulate Motions Dance Academy 337 W. Harrison Ave., New Orleans 504.410.4999 or 504.410.6009 articulatemotions.com / amdanola@gmail.com Located in Lakeview, owner Elizabeth Warshauer has a BFA in dance with 15 plus years of teaching experience. Find out for yourself why dancers and parents love everything about AMDA. Carla’s Musikgarten New Orleans Uptown 504.717.5044 carlasmusikgarten.com Teaching music, understanding children. We offer classes for children ages 3 months through 10 years. Classes are fun and educational. Both studios offer classes in all genres of dance, from the beginner to pre-professional and ages 2 1/2 through adult. Kindermusik with Madeline 3900 General Taylor St., Suite 220, New Orleans 504.717.1076 kmwithmadeline.kindermusik.com Come sing, dance, and play with us. Kindermusik is the #1 music and movement program for children ages 0 to 6 and their loving caregivers. Lelia Haller Ballet Classique 4916 Canal St., New Orleans 504.482.0038 lhballet.com A classical ballet school since 1928, Lelia Haller Ballet Classique specializes in classical ballet instruction for ages 3 to adult. We also offer classes in tap, jazz, and contemporary dance. Louisiana Academy of Performing Arts Mandeville School of Music & Dance 105 Campbell Ave #3, Mandeville 985.674.2992 laapa.com Music lessons and dance classes for kids, teens, and adults. Have fun learning to play, dance, and sing to the music you love. KID smART’s curricula go beyond typical lessons to support students as they construct and demonstrate understanding in traditional subject areas through an art form. laapa.com Music lessons and dance classes for kids, teens, and adults. Have fun learning to play, dance, and sing to the music you love. A walk-in art & play studio for kids of all ages. We provide daily art activities, weekly classes, and parties. Our play studio is set-up to allow for open-ended pretend and interactive play. No matter how they play, it’s all art to us. Schramel Conservatory of Dance is the official dance school of the New Orleans Ballet Theatre, offering dance students in the New Orleans area a chance to train with professional dancers on the highest level. Schramel Conservatory of Dance offers children’s dance classes in ballet, tap, and modern dance at all levels. The Studio School of Dance 3116 N. Arnoult Road, Suite N, Metairie 504.941.7345 thestudionola.com We teach through positive reinforcement to produce very happy and well-trained young dancers with a lifelong respect and love for dance. Offering classes in ballet, contemporary, modern, mommy and me, and more. nocca.com A regional, pre-professional arts training center that offers students intensive instruction in culinary arts, dance, media arts, filmmaking and audio production, music, theatre arts, visual arts, and creative writing, while demanding simultaneous academic excellence. When school is out, we are in. Upturn Arts provides arts enrichment classes on a sliding scale basis. Early Childhood EARLY CHILDHOOD Abeona House Child Discovery Center 3401 Canal St., New Orleans 504.486.0510 abeonahouse.org A nonprofit childcare center inspired by the Reggio Emilia philosophy, We serve families in the Greater New Orleans area with joy, equity, and love. Arden Cahill Academy – The Infant Centre 3101 Wall Blvd., Gretna 504.392.0902 ardencahillacademy.com Arden Cahill Academy offers a co-educational program with a strong emphasis on academics and cultural enrichments for students age 6 weeks through high school. Beary Cherry Tree Child Development Center	3117 Lake Villa Drive, Metairie 504.455.1950 bearycherrytree.com Family-owned and operated daycare with an excellent, caring staff, clean environment, and ongoing enrollment. Call for a private tour. Year-round Montessori preschool for ages 12 months through kindergarten – serving families since 1984. La Escuelita 1519 Dumaine St., New Orleans 504.784.0364 laescuelitaneworleans.com La Escuelita is the first Spanish immersion daycare in New Orleans. We care for 1-to 3-yearolds in a beautiful renovated home in the Tremé. Les Enfants at Trinity 1315 Jackson Ave., New Orleans 504.525.8661 www.trinitynola.org Les Enfants is Trinity’s early childhood program. Les Enfants offers two-, three- or five-day options. Nola Nature School 1009 Harrison Ave., New Orleans City Park, New Orleans 202.714.4876 nolanatureschool.com Nola Nature School offers weekday programs for children beginning at age 3 through kindergarten. These immersive experiences are centered in exploratory play and foster connectedness to peers and to the natural world. MOMMY & ME R.E.A.D. Nola 921 S. Carrollton Ave., New Orleans 504.450.3997 readnola.com R.E.A.D. (Reading Enrichment and Development) New Orleans is a dynamic early literacy program built around movement, music, acting, art, and themed activities. Offers a free childcare resource and referral service. Submit your requirements for childcare through the website or by phone and get a list of those facilities matching your needs. Louisiana Department of Social Service, Childcare and Early Childhood Education Division dss.state.la.us Offers a Child Care Assistance Program to lowincome families to help pay for childcare while the parent(s) are working or attending school. The Parenting Center at Childrenâ&#x20AC;&#x2122;s Hospital 938 Calhoun St., New Orleans 504.896.9591 theparentingcenter.net Family resources, two drop-in centers, parenting guidance, coaching and classes, resource library and referral services, and parent-child enrichment activities. Education CHARTER SCHOOLS Arthur Ashe Charter School 1456 Gardena Drive, New Orleans 504.373.6267 firstlineschools.org/arthur-ashe-charter-school Grades kindergarten to 8th. Audubon Charter School Lower School 428 Broadway St., New Orleans 504.324.7100 Upper School 1111 Milan St., New Orleans 504.324.7110 Gentilly 4720 Painters St., New Orleans 504.309.9434 auduboncharter.com Grades pre-k 3 to 8th. Benjamin Franklin High School 2001 Leon C. Simon Drive, New Orleans 504.286.2600 bfhsla.org Grades 9th to 12th. Edward Hynes Charter School 990 Harrison Ave., New Orleans 504.483.6100 hynesschool.org Grades pre-k to 8th. International High School of New Orleans 727 Carondelet St., New Orleans 504.613.5703 ihsnola.org Grades 9th to 12th. EDUCATION Dixon Campus – French and Spanish Language Immersion 4040 Eagle St., New Orleans 504.934.4875 isl-edu.org/dixon-campus Grades kindergarten to 2nd. John W. Hoffman Early Learning Center 2622 S. Prieur St., New Orleans 504.335.0444 nolacollegeprep.org Ages 6 weeks to 4 years. Lafayette Academy Charter School 2727 S. Carrollton Ave., New Orleans 504.861.8370 lafayetteacademyno.org Grades pre-k to 8th. Lake Forest Charter School 11110 Lake Forest Blvd., New Orleans 504.826.7140 lakeforestcharter.org Grades kindergarten to 8th. Lawrence D. Crocker College Prep 2301 Marengo St., New Orleans 504.335.0404 crockercollegeprep.org Grades pre-k to 8th. Lusher Charter School Lower School 7315 Willow St., New Orleans 504.862.5110 Middle & High School 5624 Freret St., New Orleans 504.304.3960 lusherschool.org Grades kindergarten to 12th. EDUCATION Lycee Français de la Nouvelle-Orléans – French Immersion Patton Campus 5951 Patton St., New Orleans Johnson Campus 1800 Monroe St., New Orleans 504.620.5500 lfno.org Grades pre-k to 8th. A new grade level will be added every year up to grade 12. Martin Behrman Charter School 715 Opelousas Ave., New Orleans 504.302.7090 algierscharterschools.org/schools/behrman Grades pre-k to 8th. Morris Jeff Community School Main Campus 211 S. Lopez St., New Orleans 504.373.6258 High School Campus 1301 N. Derbigny St., New Orleans 504.355.0210 morrisjeffschool.org Grades pre-k to 10th. Samuel J. Green Charter School 2319 Valence St., New Orleans 504.304.3532 firstlineschools.org/samuel-j-green-charterschool Grades pre-k to 8th. INDEPENDENT & PRIVATE SCHOOLS Academy of the Sacred Heart 4521 St. Charles Ave., New Orleans 504.269.1213 ashrosary.org Sacred Heart is a Catholic, independent, collegeprep school for girls ages 1 through grade 12. Archbishop Rummel High School 1901 Severn Ave., Metairie 504.834.5592 rummelraiders.com Grades 8th to 12th. Arden Cahill Academy 3101 Wall Blvd., Gretna 504.392.0902 ardencahillacademy.com Arden Cahill Academy offers a co-educational program with a strong emphasis on academics and cultural enrichments for students ages 6 weeks through high school. Atonement Lutheran Church and School 6500 Riverside Drive, Metairie 504.887.0225 alcs.org Since 1960, Atonement provides an affordable education in a purposefully small Christcentered environment for pre-k 3 to 8th grade. Ecole Bilingue de la Nouvelle-Orléans 812 General Pershing St., New Orleans 504.896.4500 ebnola.com Ecole Bilingue is the only private French school in New Orleans accredited by the French Ministry of Education and educates children ages 2 years old through 8th grade. Kehoe-France is a private, non-denominational, co-educational school, serving 8-week-old infants through 7th grade. Children are nurtured in a warm and welcoming environment with small class sizes on a 14-acre campus. Nola Nature School offers weekday programs for children beginning at age 3 through kindergarten. These immersive experiences are centered in exploratory play and foster connectedness to peers and to the natural world. 300 Park Road, Metairie 504.837.5204 mpcds.com Grades pre-k to 12th. Ridgewood is an independent, college preparatory, unit school in the New Orleans metro area serving grades pre-K to 12th. St. George’s is a private, co-educational, independent school for students age 1 to 8th grade. Dominican is a private, Catholic, college preparatory school for girls in grades 8th to 12th. St. Andrew’s Episcopal School enrolls boys and girls from 18 months through 8th grade and promotes academic excellence in a small, nurturing environment. St. Ann School 4921 Meadowdale St., Metairie 504.455.7051 stannschool.org St. Ann enrolls boys and girls from 2 years through 7th grade and offers a challenging academic curriculum in a Catholic environment. St. Catherine of Siena School provides a community of faith that fosters academic excellence and a foundation for a Christcentered life for students in grades pre-k 3 to 7th. 4901 W Metairie Ave, Metairie, LA 504.888.6353 steddyschool.com Traditional Catholic school, pre-k to 7th grade — rigorous academics, fine arts, foreign language, extensive extracurriculars, involved families, and happy students. St. Pius X School 6600 Spanish Fort Blvd., New Orleans 504.282.2811 stpiusxnola.org St. Pius X is a pre-k 3 to 7th grade Catholic, co-educational school dedicated to achieving academic excellence, high standards of morality, and the values of the Catholic faith. St. Paul’s is a private, co-educational, independent school, serving infants through 8th grade and offering a wide range of exceptional academic and enrichment programs. Stuart Hall School for Boys 2032 S. Carrollton Ave., New Orleans 504.861.1954 stuarthall.org Stuart Hall is an independent, Catholic school offering education to boys in pre-k 3 through 7th grade. EDUCATION Ursuline Academy 2635 State Street, New Orleans 504.861.9150 www.uanola.org / admissions@uanola.org Ursuline Academy, founded in 1727, is a Catholic school for girls offering a diverse educational environment from early childhood (toddler 1) through a college-prep secondary program (grade 12). PRIVATE PRESCHOOLS Academy of the Sacred Heart – Little Hearts Early Learning Program 4301 St. Charles Ave., New Orleans 504.269.6510 ashrosary.org/littlehearts Little Hearts Early Learning Program for ages 1-3 helps girls grow in all areas — social, emotional, cognitive, physical, and spiritual. Arden Cahill Academy 3101 Wall Blvd., Gretna 504.392.0902 ardencahillacademy.com Arden Cahill Academy offers a co-educational program with a strong emphasis on academics and cultural enrichments for students from 6 weeks through high school. Cathedral Montessori School 9 Fortress Road, New Orleans 504.252.4871 cathedralmontessori.com An accredited Montessori school offering students skills for the challenges of the 21st century in multi-age classrooms. Currently serving ages 3-6 and grades 1st-3rd. Opening grades 4th-6th in the fall of 2020. The Early Learning Center of Woodland Church 5824 Berkley Drive, New Orleans 504.394.8781 wpcno.org The ELC is a half-day, Christian Educational Developmental Preschool for children ages 1 year through kindergarten. Extended-day options are available. Kehoe-France School 720 Elise Ave., Metairie 504.733.0472 kehoe-france.com Ages 8 weeks-7th grade Kehoe-France is a private, non-denominational, co-educational school, serving 8-week-old infants through 7th grade. Children are nurtured in a warm and welcoming environment with small class sizes on a 14-acre campus. EDUCATION Kehoe-France is a private, non-denominational, co-educational school, serving 8-week-old infants through 7th grade. Children are nurtured in a warm and welcoming environment with small class sizes on a 14-acre campus. University Montessori School 7508 Burthe St., New Orleans 504.865.1659 umsnola.org Dedicated to the Montessori philosophy and method of education, UMS devotes itself to the total child — the emotional, social, intellectual, and physical well-being. Ursuline Academy 2635 State Street, New Orleans 504.861.9150 www.uanola.org / admissions@uanola.org Ursuline Academy, founded in 1727, is a Catholic school for girls offering a diverse educational environment from early childhood (toddler 1) through a college-prep secondary program (grade 12). Mount Olive Lutheran Preschool 315 Ridgelake Drive, Metairie 504.835.3891 mountolivelutheran.net Celebrating 42 years of providing developmentally appropriate education in a Christ-centered environment. New Orleans JCC Nursery School and Pre-K 5342 St. Charles Ave., New Orleans 504.897.0143 nojcc.org Offering an outstanding pre-k and nursery school in an environment encouraging creativity and exploration. Who doesn’t love living in New Orleans? We’ve got 300 years of practice being fun, funky, and quite a bit different from anywhere else. But if you’re like us, often the only time you see the really cool things our city has to offer is when you’re playing tour guide for out-of-town guests. We think it’s time to change that, so we’ve highlighted our favorite stops along two popular routes. Climb aboard! Oak Street there are a ton of great places to eat up and down this street. The Historic St. Charles Streetcar Line is the oldest continuously operating street railway system in the world. This line begins at the Mississippi River on Canal Street and follows Canal to Carrollton Avenue where it turns right ending at City Park. This line is air-conditioned – a great option for those super hot days. Pro tip: if you’re going to the aquarium, jump off the stop before Canal Street, at Peters St, to save time and crowds. Fire Safety Tips To help keep your family safe, we’re sharing some important info and tips from the National Fire Prevention Association. Common causes of house fires and fire-related deaths •	Cooking is the top cause of home fires and home-fire injuries – 40 percent of home fires start in the kitchen, with frying being the leading culprit. •	More than half of those injured in fires involving cooking were hurt while trying to extinguish the fire. •	Smoking is the leading cause of civilian (non-firefighter) home-fire deaths; heating equipment is the second-most common cause. •	Clothes dryers are another common cause of house fires, causing nearly 17,000 fires each year nationwide. The top reason a dryer catches fire? A clogged lint filter. •	Candles cause an average of 25 home fires each day. Playing with Fire •	Younger children are more likely to set fires inside homes; tweens and teens are more likely to set fires outdoors. •	Boys are much more likely to play with fire than girls, setting 83 percent of home structure fires. •	More than a third of fires caused by kids playing with matches or lighters began in a bedroom. Creating Safer Homes •	Close all bedroom doors at night to slow the spread of smoke, heat and fire. •	Install smoke alarms in and outside every bedroom, and on every level of the home. •	Let children know that matches and lighters are for adult-use only. •	Test the batteries in smoke detectors every 6 months and replace smoke detectors every 10 years. Family Biking Do you love biking with your family or would you like to start? We’ve got the best bets for a family bicycling adventure in New Orleans and beyond! Lafitte Greenway This 2.6-mile linear park opened in 2015 and cuts a swath from Basin Street in the Tremé neighborhood to the intersection of N. Alexander and St. Louis streets, just four blocks past Carrollton Avenue in Mid-City. With its 12-foot-wide path, there is plenty of room for bikers, joggers and walkers. Mississippi River Levee Trail This popular path runs unabated from Audubon Park all the way to Norco in St. Charles Parish, more than 20 miles away. Novice cyclists should be careful because it can be windy near the water. Open year-round with 12 acres of gardens and art. Last Saturday of each month, 10 am-4 pm (dates can change due to holidays, so check the website). Featuring paintings, photography, jewelry, and more from the region’s best artisans, with live music and food. French Market District From the Upper Pontalba Building and Cafe du Monde to the farmers and flea markets along Decatur Street. 504.363.6400 frenchmarket.org The French Market District spans six blocks in the historic French Quarter and includes Crescent Park, a 1.4 mile urban park nestled along the banks of the Mississippi River. The District is a uniquely New Orleans experience from the Upper Pontalba Building on Jackson Square through the Colonnade offering boutique shopping, open-air cafés, and confections, to the eclectic farmers and flea markets with a host of local art, found treasures, and imported goods. A year-round park with 1,300 acres of family fun with something for everyone. You name it, and it’s in New Orleans City Park. INDOOR PLAY Bookoo Bounce 5604 Blessey St., Elmwood 504.835.6424 bookoobounce.com Indoor kids’ party venue with inflatable play areas, obstacle courses, and slides. The Parenting Center at Children’s Hospital 938 Calhoun St., New Orleans 504.896.9591 theparentingcenter.net Family resources, two drop-in centers, parenting guidance, coaching and classes, resource library, and referral services, and parent-child enrichment activities. Main Library 219 Loyola Ave., New Orleans 504.596.2560 Storytime and craft: Every Friday at 12:30 pm and Saturdays at 10:30 am. For families and caregivers with children ages 7 and younger. Algiers Regional Branch 3014 Holiday Drive, New Orleans 504.596.2641 Storytime: Tuesdays at 10:30 am, Saturdays at 2:30 pm. For families and caregivers with children ages 5 and over. Storytime: Tuesdays at 11 am. For families and caregivers with children ages 5 and younger. Cita Dennis Hubbell Branch 725 Pelican Ave., New Orleans 504.596.3113 Storytime: Tuesdays and Thursdays at 10:30 am. For families and caregivers with children ages 5 and younger. Storytime: Wednesdays at 10:30 am (ages 2-5) and Saturdays at 10:30 am (all ages). Offering educational programs, birthday celebrations in the Discovery Garden, and summer camp for kids. Storytime: Wednesdays at 10:30 am. For families and caregivers with children ages 5 and younger. New Orleans’ premier attraction for children, families, and school groups that features memorable interactive experiences designed to make learning fun. Moving to City Park in late Summer 2019. Check www.lcm.org for updates. Robert E. Smith (Lakeview) Branch 6301 Canal Blvd. (at Harrison Avenue), New Orleans 504.596.2638 Storytime: Thursdays at 11 am. For families and caregivers with children ages 5 and younger. The museum tells the story of the American Experience in the war that changed the world, so that all generations will understand the price of freedom and be inspired by what they learn. FAMILY FUN New Orleans Museum of Art One Collins C. Diboll Circle, New Orleans City Park, New Orleans 504.658.4100 noma.org NOMA offers innovative experiences for learning and interpretation, and uniting, inspiring, and engaging diverse communities and cultures. Ogden Museum of Southern Art 925 Camp St., New Orleans 504.539.9650 ogdenmuseum.org Activities and exhibitions for families and children year-round, focusing on Southern culture. Southern Food and Beverage Museum 1504 Oretha Castle Haley Blvd New Orleans, LA 70113 504.569.0405 https://natfab.org/kids-in-the-kitchen/ Weekend hands-on cooking classes for children 7-13, school tours, scout classes, scavenger hunts, and more. SUMMER & SEASONAL CAMPS All Star Gymnastics, Tumbling & Cheerleading 2073 Bonn St., Harvey 504.328.3838 allstargymnola.com Active gymnastics camps for boys and girls. All Olympic gymnastics events will be covered daily, along with games and a weekly art project. Perfect for beginner and experienced gymnasts. Beary Cherry Tree Child Development Center 3117 Lake Villa Drive, Metairie 504.455.1950 bearycherrytree.com Beary Cherry Tree offers a variety of activities for campers including field trips, arts and crafts, Soccer Tots, water play, and snoballs. Camp Corral at Arden Cahill Academy 3101 Wall Blvd., Gretna 504.392.0902 ardencahillacademy.com Have a “whale” of a summer on the 12-acre campus. Camp activities include horseback riding, swimming, art, STEAM LAB, theater arts, sports, academic enrichment classes, and much more. Campers ages 3 (camper must turn 4 by Sept. 30, 2019) through 14 are welcome to attend. Contemporary Arts Center 900 Camp St., New Orleans 504.528.3805 cacno.org The CAC Summer Arts Camp ignites campers’ imaginations with classes in music, visual arts, digital arts, theater, culinary arts, and dance workshops. Come explore your talents. JCC Summer Camps 5342 St. Charles Ave., New Orleans 3747 W. Esplanade Ave., Metairie 504.897.0143 (New Orleans), 504.887.5158 (Metairie) nojcc.org Campers ages 21 months to 8th grade enjoy indoor and outdoor activities including art, drama, music, science, sports, water play, and swim instruction led by caring, American Red Cross water safety instructors. FAMILY FUN Celebrating its 70th camp season this year, Kehoe-France camp includes swimming (for campers 4 and older), tennis, archery, field sports, arts and crafts, computers, and much more on a picturesque 14-acre campus. Summer Camp at Atonement Lutheran 6500 Riverside Drive, Metairie 504.887.0225 / churchoffice@alcs.org alcs.org Summer Camp at Atonement in Metairie. A FUN and affordable option for your family. Camps for kids in preK-6th grade. Sports and hobby camps. Contact Rose Schutt with any questions. During four weeks of camp, May 28-June 21, campers will explore all things STEAM — science, technology, engineering, art, and mathematics — through fun, hands-on experiments and open-ended exploration. 4301 St. Charles Ave., New Orleans 504.269.1230 ashrosary.org/summer Calling all boys and girls ages 1 to 13. Enroll in our day camps for theater, cheer, arts, dance, sports, water fun, enrichment. and more. Weekly camps emphasize imagination and creativity through the development of artistic skills in visual and performing arts. Inspired by nature, campers participate in a variety of arts projects, music, and outdoor play in a Montessori environment. Fun and sports all day long for kids 5-12. Playmakers Indoor is a state-of-the-art indoor turf facility located in Harahan offering sports camps, holiday camps, and more. Southern Food and Beverage Museum 1504 Oretha Castle Haley Blvd New Orleans, LA 70113 504.569.0405 natfab.org/events/sofabs-summer-kidsculinary-camp-2019 SoFAB Kids Culinary Camp is a week-long, halfday camp teaching culinary skills through food preparation, crafts, history, games, and eating. Ages- 7-11 years old; teens+/- week- 11-15 years old. Upturn Arts offers school break (MLK Day, post-Mardi Gras, spring, fall, Thanksgiving, and Christmas breaks) and 12 weeks of summer camps focused on performing and visual arts for kids ages 4-12. creARTive grants available. Along the Mississippi River, with entrances at Bartholomew, Piety and Marigny streets. This beautiful, 1.4-mile urban linear park spans 20 acres and offers great views of the cityâ&#x20AC;&#x2122;s skyline. City Park Avenue at Carrollton Avenue. One of the oldest urban parks in the country, City Park is home to numerous playgrounds, Storyland, Carousel Gardens Amusement Park, Morning Call, water activities and much more. 2. Palmer Park, Carrollton Carrollton Avenue at S. Claiborne Avenue. This hilly (for New Orleans) park is home to the monthly Arts Market New Orleans and contains a large, shaded play area, with benches for keeping an eye on the kids. 3. Audubon Park, Uptown St. Charles Avenue, between Walnut Street and Exposition Boulevard. Home to the Audubon Zoo and an 18-hole golf course, this park also features two brand-new play structures that children can climb as the streetcars roll by. 4. Danneel Playground, Uptown St. Charles Avenue at Octavia Street. This park, which runs along the streetcar line, has separate play structures for older and younger kids, as well as a huge open field for Frisbee, football and picnics. 6. Kenilworth Playground, Lakeshore 7820 Redfish St. This playground near the Lakefront Airport features a great play structure with fun slides, a rope-climbing apparatus and swings, as well as baseball fields and basketball courts. 7. Confetti Park, Algiers Point Pelican Avenue at Verret Street. A lovely, small playground in the heart of old Algiers that is suitable for kids of varying ages. 8. Gretna Heritage Playground, Old Gretna Gretna Street at Huey P. Long Avenue. This playground features separate play structures for big and little kids, with swings, a merry-goround, monkey bars, a seesaw and more. 11. Lafreniere Park, Metairie 3000 Downs Blvd. This huge park has it all â&#x20AC;&#x201C; several playgrounds, sports fields, a lagoon for feeding ducks, a spray park, disc golf, picnic spots, a 2-mile-long walking trail and more. 1521 Palm St. This playground features something for everyone, including a running track, baseball fields, tennis courts and an indoor gymnasium. 10. Bonnabel Boat Launch, Metairie Bonnabel Boulevard at Lake Pontchartrain. This fenced playground is topped by a rubberized mat to keep kids safe, while the boat launch, dog park and fishing pier will keep kids of all ages busy. Loyola Drive at Vintage Drive. This wellmaintained space is fenced and has a cool climbing apparatus and slippery slides, plus a pavilion, a 1/4-mile walking track, a handicapaccessible playground and more. Pat Blackwell, Ph.D. 1539 Jackson Ave., Suite 300, New Orleans 504.581.3933 pelts-kirkhart.com/clinicians/pat-blackwell/ Psychologist Pat Blackwell provides consultation for parents and evaluation for infants, children, and adolescents. Breathe Easy Allergy and Asthma 1111 Medical Center Blvd., Suite. N-804, Marrero, 504.934.8777 525 Prytania Street, Suite 220, New Orleans, 504.826.8030 breatheeasyallergy.com Breathe Easy Allergy and Asthma is a familyfounded practice with specialized expertise in treating all types of allergic diseases including nasal allergies, respiratory issues, sinus problems, chronic sinusitis, and food allergies. Metairie, Lakeview and Northshore locations 2901 N. I-10 Service Road E., Suite 300 in Metairie Louisiana- main office 504.780.1702 familybehavioralhealthcenter.com Gifted and talented evaluations, ADD/ADHD testing, evaluations for autism spectrum disorders, and psychoeducational and psychological evaluations, ages 2 to adulthood. PCA offers free, anonymous, and confidential parenting help, crisis intervention, and referrals to community resources. Call its KIDLINE at (1.800.CHILDREN) for free parenting support 24 hours a day, seven days a week. Metairie, Lakeview, and Northshore locations 2901 N. I-10 Service Road E., Suite 300, Metairie main office 504.780.1702 familybehavioralhealthcenter.com Gifted and talented evaluations, ADD/ADHD testing, evaluations for autism spectrum disorders, and psychoeducational and psychological evaluations, ages 2 to adulthood. PEDIATRIC AND FAMILY DENTISTRY Dr. Jason Parker 2201 Veterans Memorial Blvd., Suite 306, Metairie 504.831.2120 docparker4kids.com Pediatric dentist serving infants, children, and teens in Metairie and surrounding areas. Uptown Pediatric Dentistry Susan Falllahi, DDS 3715 Prytania St., Suite 380, New Orleans 504.896.7435 uptownpediatricdentistry.com Comprehensive dental care for infants, toddlers, and older children, including those with special needs. FERTILITY/REPRODUCTION Vivere-Audubon Surgery Center & Fertility Laboratory 2701 Napoleon Ave., New Orleans 504.564.7965 viverehealth.com/audubon Lindsay Wells, MD, and Eric Laborde, MD, specialize in comprehensive male and female reproductive care. Touro Infirmary 1401 Foucher St., New Orleans 504.897.7011 touro.com Known by locals as “the place where babies come from,” Touro is a hospital offering comprehensive health care services. We provide your pets with the most advanced medical care a large hospital can with the personal attention you deserve. In-home lice removal service. Non-toxic, effective, and confidential with a knowledgeable staff. Nitpicking in NOLA 504.258.6091 nitpickinginnola.com South Louisiana’s first lice removal company, in business since 2010. We come to you. Discreet. Confidential. Guaranteed. 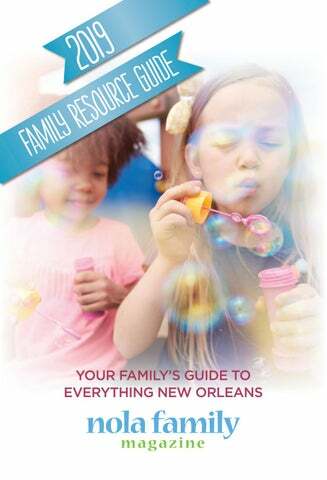 938 Calhoun St., New Orleans 504.896.9591 theparentingcenter.net Family resources, two drop-in centers, parenting guidance, coaching and classes, resource library and referral services, and parent-child enrichment activities. If you love our magazine and have some sales experience, we’d love to talk. nola family We’re looking for great talent to join our growing team of digital and print account executives. Interested? PRIMARY CARE Crescent City Physicians Inc. 3600 Prytania St., Suite 35, New Orleans 504.897.7197 touro.com/CrescentCityPhysicians Primary care physicians located throughout the New Orleans area. Our caring physicians specialize in transitioning patients into adult medicine. Pediatric OT services for children to address difficulties in fine and gross motor skills, handwriting, self-care skills, feeding, and play. We treat a variety of diagnoses in a fun, outpatient setting. Therapeutic Learning Center 3329 Metairie Road, Metairie 504.565.7300 tlcnola.com TLC is a pediatric occupational therapy clinic dedicated to improving the well-being of children throughout the New Orleans area. TLC supports all children to enhance learning and development from infancy through high school. URGENT CARE In & Out Urgent Care – Old Metairie 100 N. Labarre Road, Metairie 504.827.1717 inandouturgentcare.com Next door to Planet Fitness, In and Out Urgent Care – Old Metairie provides personable, affordable, and convenient quality care to patients in need of non-life-threatening conditions. Feel Better Faster. In & Out Urgent Care – Uptown 6225 S. Claiborne Ave., New Orleans 504.864.8080 inandouturgentcare.com Across the street from Tulane University’s football stadium, In & Out Urgent Care – Uptown provides personable, affordable, and convenient quality care to patients in need of non-lifethreatening conditions. Feel Better Faster. Local Markets Here’s a guide to help you make a fun-filled day of it as you navigate your way around the best NOLA has to offer — great, fresh, locally sourced food, and some pretty cool arts and crafts, too! Abita Springs Art and Farmers Market 22049 Main St., Abita Springs 985.892.0711 townofabitasprings.com/farmers-market Every Sunday, noon-4 pm Locally grown produce, baked goods, meats, dairy, and more. Arts Market of New Orleans Palmer Park, corner of S. Carrollton and S. Claiborne avenues, New Orleans 504.523.1465 artscouncilofneworleans.org Last Saturday of each month, 10 am-4 pm (dates can change due to holidays, so check the website) Featuring paintings, photography, jewelry, and more from the region’s best artisans. While you’re browsing, take a break and check out the live music by Louisiana musicians and delicious food made by local vendors. Covington Farmers Market Covington City Hall, 609 North Columbia St., Covington, 8 am-noon (every Saturday) Covington Trailhead, 419 N. New Hampshire Ave., Covington, 10 am-2 pm (every Wednesday) 985.966.1786 or 985.630.1401 covingtonfarmersmarket.org Fruit and vegetables from local producers, and locally-produced eggs, milk, cheese, meat, poultry, and seafood. Prepared items include jam and jelly, juice and popsicles, Greek and Mediterranean food, authentic Mexican salsas and tamales, Italian food, bread, pastries, pies, candy, and more. The market offers a broad selection of live native, ornamental, and culinary plants. Bucktown Harbor, 325 Metairie Hammond Hwy., Metairie, 3-7 pm (every Friday) 750 Carondelet St., New Orleans, 8 am-noon (every Saturday) LaSalle’s Landing, Williams Blvd. at the River, Kenner, 9 am-1 pm (every Saturday) 504.861.4488 crescentcityfarmersmarket.org Year-round market featuring seasonal fruits, veggies, and seafood, as well as baked goods, dairy, exotic meats, grass-fed beef and pork, flowers, and plants. Freret Market 4421 Freret St., New Orleans freretmarket.org First Saturday of the month, except for June, July, and August, 11 am-4 pm The market is split along three category lines: food, art, and flea. Besides all of the great shopping every week, the market also hosts local restaurants, live music, and a kids’ area. German Coast Farmers Market Winnwood Shopping Center, 1313 Paul Maillard Road, Luling, 1-5 pm (every Wednesday) Ormond Plantation, 13786 River Road, Destrehan, 8 am-noon (every Saturday). 504.782.8517 germancoastfarmersmarket.org Fresh fruit, vegetables, flowers, and other products. 801 Harrison Ave., New Orleans 504.535.4486 harrisonavenuemarketplace.org Second Wednesday of every month, 5-8:30 pm (no market in June through August). It’s more of a family-friendly “happening” than a farmers or art market, with music and entertainment, in addition to the vendors offering food and handmade crafts. Sankofa Fresh Stop 5200 Dauphine St. 504.872.9214 sankofanola.org Monday-Thursday, 9:30 am-4 pm Open-air fresh produce market with locallysourced produce, eggs, and seafood. Sankofa Mobile Market Villa St. Maurice, 500 St Maurice Ave., New Orleans, 3-4 pm (second and fourth Tuesdays) Hollygrove Senior Center, 3300 Hamilton St., New Orleans, 1-2 pm (second and third Thursdays) L9 Senior Center, 1616 Caffin Ave., New Orleans, 11 am-noon (third Thursdays) Royal Castle Childhood Center, 3800 Eagle St., New Orleans, 4-5 pm (first Fridays) Broadmoor Arts and Wellness Center, 3900 General Taylor St., New Orleans, 3-4 pm (second Fridays) Works with the open-air market to strengthen the community-based food system by linking fresh food to the 9th Ward. 300 block of Huey P. Long Avenue, Gretna 504.363.1500 gretnafarmersmarket.com Every Saturday, 8:30 am-12:30 pm, rain or shine. Fresh produce, baked goods, barbecue, prepared foods, gift items, and more. While she might not possess all the powers of Mary Poppins or Nanny McPhee, the right nanny can bring some sense of magic to a household: a caring, competent adult with tireless energy and enthusiasm who loves, respects, and admires your child and your family. We’ve reached out to some parents, as well as a nanny agency, Nurture Nannies, to get some tips on finding the best nanny for your needs. Questions to ask a nanny agency: •	How much experience does your average nanny have? •	How do you handle reference and background checks? •	What special training or certifications do your nannies have? •	How do you charge and what services are included in this fee? •	How long does it normally take to have a nanny in place? What if I need someone right away? •	What if the nanny doesn’t work out? Questions to ask a potential nanny: •	What ages have you worked with? •	What’s your parenting style? •	Where do you see yourself in five years? •	How do you see your role evolving as the children get older? •	What’s an emergency situation you’ve encountered, and how did you handle it? 3600 Prytania St., Suite 35, New Orleans 504.897.7197 crescentcityphysicians.org Certified nurse-midwives provide personalized care to women of all ages and attend births at Touro’s Family Birthing Center. Touro Family Birthing Center 1401 Foucher St., New Orleans 504.897.7319 touro.com/fbc Touro is known as “the place where babies come from.” Equipped with labor/delivery/ recovery suites, acute neonatal intensive care services, and a comprehensive infant security system, Touro has been the hospital of choice for generations of New Orleanians. West Jefferson Medical Center – The Family Birth Place 1101 Medical Center Blvd., Marrero 504.349.6200 wjmc.org/familybirth WJMC Family Birth Place is dedicated to providing a positive pregnancy and birth experience – from prenatal classes to quality nursing staff in labor/delivery, postpartum, nursery and our NICU. 4200 Houma Blvd., 4th floor, Metairie 504.503.4323 ejgh.org An international board-certified lactation consultant is available seven days a week to offer support during and after pregnancy. Learn the nutritional value of breast milk, your baby’s weight gain, milk supply concerns, and more in this free support group. Lactation Center, Touro Infirmary 1401 Foucher St., 2nd floor, New Orleans 504.897.8130 touro.com/fbc-lactation Open seven days a week during your stay and by appointment for non-patients for breastfeeding support and assistance. Breastfeeding supplies also available for purchase. OB-GYN Crescent City Physicians Inc. Multiple locations 504.897.7197 crescentcityphysicians.org OB-GYNs provide quality and compassionate care throughout the New Orleans area and attend births at Touro’s Family Birthing Center. Multiple locations 866.624.7637 ochsner.org/women Ochsner OB-GYN physicians provide a full-range of women’s services. 1111 Medical Center Blvd., Marrero 504.349.6945 wjmc.org/WomensHealth West Jeffersons Women’s Health offers the latest in women’s health care, with a commitment to providing exceptional care through education and collaboration from puberty through menopause. 4720 S. I-10 Service Road 504.988.8070 tulaneobgyn.com Offering comprehensive OB/GYN services and minimally invasive surgery. From well-women exams and infertility consultations to family planning and menopausal management, we offer compassionate care, no matter what concerns you may have. They do all the work, you have all the fun. Call for walk-in play availability. Three generations of quality. Haydel’s creates masterful cakes and treats for any occasion. A walk-in art & play studio for kids of all ages. We provide daily art activities, weekly classes, and parties. Our play studio is set-up to allow for an open-ended pretend and interactive play. No matter how they play, it’s all art to us. Hand-decorated cookies, birthday cakes, cupcakes, and so much more. Little Pnuts Toy Shoppe is your one stop shop for every occasion and for every age. Featuring toys, games, books, STEM, activities, party games, party supplies, and balloons, too. Art Bus Nola 504.905.0213 artbusnola.com A mobile art studio that creates a fun learning environment for kids of all ages, designed for preschools, birthday parties, and special events. Longue Vue House & Gardens 7 Bamboo Road, New Orleans 504.488.5488 longuevue.com/kids-birthday-celebration Birthdays at Longue Vue are full of fun, adventure, and learning! Celebrate with a Birthday Tea or a Garden Birthday. PARTY PLANNING Louisiana Children’s Museum 420 Julia St., New Orleans 504.523.1357 lcm.org New Orleans’ premier attraction for children, families, and school groups that features memorable interactive experiences designed to make learning fun. New Orleans City Park New Orleans City Park, 5 Victory Ave., New Orleans neworleanscitypark.com This 1,300-acre, year-round park offers something for everyone. You name it, and it’s in New Orleans City Park. Celebrate birthdays or other special events with a pool party. Our memorable parties never rain out. 6124 Jefferson Hwy. Harahan 504.305.6078 playmakersindoor.com/locations/southshore Playmakers Indoor is a state-of-the-art indoor turf facility located in Harahan offering youth flag football and soccer, basketball court and turf field rentals, Tots Sports classes, parties, and camps. Mad Science brings the science lab to you. Mad Science parties offer interactive science experiments with a certified Mad Scientist. One of the city’s classic snoball stands, Plum Street opened in 1945 and has kept the crowds lining its namesake corridor ever since. 4801 Tchoupitoulas St., New Orleans, 504.891.9788. Open Tuesday thru Sunday, 1-7 pm. Closed Monday. Arguably the most well-known of the city’s snoball stands, Hansen’s has stood the test of time, first opening its doors in 1939. And the legend lives on, as the James Beard Foundation has named Hansen’s an American Classic. Imperial Woodpecker Sno-Balls 3511 Magazine St. and Riverwalk at Spanish Plaza, New Orleans, 251.366.7777. Open daily, noon-7:30 pm. This relative newcomer to the city’s snoball scene offers a curated selection of classic flavors, plus several unique creations, such as Lemon-Basil, Earl Grey Cream and WatermelonJalapeno. Pandora’s Snowballs 901 N. Carrollton Ave., New Orleans, 504.289.0765. Open daily, noon-7 pm. The closest snoball stand to New Orleans City Park and Bayou St. John, Pandora’s serves up more than 140 flavors daily, including the popular Tootsie Roll, Tiger’s Blood and Cream Soda, and offers alternative choices such as clear and sugar-free snoballs. Ro-Bear’s 6869 Jefferson Highway, Harahan, 504.737.5013. Open daily, noon-9 pm. A family-run business that has been a Harahan staple for more than 50 years, Ro-Bear’s makes all its syrups in-house, with the thick, rich Chocolate, Coffee and Strawberry Cheesecake among the most popular of the stand’s 60-plus flavors. Sal’s Sno-Balls 1823 Metairie Road, Metairie, 504.666.1823. Open Monday thru Saturday, 11 am-11 pm; Sunday, 1-11 pm. Sal’s has stood sentry on Metairie Road for more than a half century, delighting fans young and old with perennial favorites such as the Pink Squirrel, Batman and Orchid Vanilla. SnoWizard 4001 Magazine St., New Orleans, 504.899.8758. Open daily, noon-8 pm. This snoball stand on the corner of Magazine and Constantinople streets started it all, as owner George Ortolano in 1936 invented the first snoball machine, capable of transforming huge blocks of ice into flakes akin to snow. 1700 Airline Drive, Metairie 504.837.0533 lejouet.com A specialty toy store that carries traditional favorites, as well as the newest trends in toys, games, books, and bicycles. We throw customized parties and events for all ages. 100 Atherton Drive, Metairie 504.837.0447 banburycrosskids.com Fine children’s clothing and shoes for portraits, weddings, christenings, special occasions, and gifts. Traditionally-inspired specialty store featuring local artists, home accoutrements, children’s specialty clothing and gifts, women’s shoes, accessories, and carpool couture. Unique, locally-owned toy store with puzzles, games, and many more playthings for kids of all ages. Girl, tween, teen — clothes and accessories for young ladies. Fashion fun with a sophisticated flair. LET’S SHOP ZukaBaby 3248 Severn Ave., Metairie 504.407.2700 zukababy.com Voted #1 Baby Store in greater NOLA, ZukaBaby is a mom-owned modern baby boutique specializing in the latest strollers, car seats, local gifts, and registry services. Shop online and pick up in store or ship nationwide. PHOTOGRAPHY Twirl Photography 504.388.8739 twirlphotography.com A modern lifestyle photography studio in New Orleans specializing in candid maternity, child, and family images. RESALE BOUTIQUE Once Upon A Child 3122 Severn Ave., Metairie 504.281.4996 onceuponachildmetairie.com Brand name kids’ clothing, shoes, and so much more for up to 70 percent less than retail prices. Since 1976, Educator has provided customers of all ages with a fun, educational shopping experience with a unique selection of over 25,000 products that make learning creative and fun. 504.464.5733 asgno.org ASGNO empowers, educates, and supports individuals affected by autism through educational opportunities, information and referral services, and support services. Crane Rehab Center LLC – Pediatrics 8300 Earhart Blvd., Suite 100, New Orleans 504.866.6990 cranerehab.com For nearly 20 years, Crane Rehab Center Pediatrics has provided children and families with comprehensive, evidence-based, highquality, physical, occupational and speech therapy, and ABA services. Kim4Kids 2237 N. Hullen St., Suite 202, Metairie 504.517.5437 kim4kidsnola.com Pediatric OT services for children to address difficulties in fine and gross motor skills, handwriting, self-care skills, feeding, and play. We treat a variety of diagnoses in a fun, outpatient setting. Enjoy a different style of therapy in warm, saltwater pools with extensively trained, experienced, and supportive instructors with special needs classes customized for each child’s emotional and developmental abilities. East Jefferson YMCA 6691 Riverside Drive, Metairie 504.888.9622 ymcaneworleans.org Brushes, Buddies, and Beyond is a painting class for autistic children ages 5-18, ending with a gallery showing for the family to attend. EDUCATION The Chartwell Center 1225 Magazine St., New Orleans 504.899.2478 thechartwellcenter.org Serving New Orleans-area children with autism spectrum disorder. Programs for students with visual impairments or who are blind. The St. Michael Special School educates students with mild to moderate special needs, academically, physically, emotionally, and spiritually. Ages 6 to adulthood. Louisiana School for the Deaf 2888 Brightside Lane, Baton Rouge 225.757.3202 lalsd.org A state school for deaf and hard-of-hearing students in Louisiana. Louisiana School for the Visually Impaired 2888 Brightside Lane, Baton Rouge 225.757.3481 lsvi.org LSVI offers blind and visually impaired students academic, career, and social opportunities to achieve their full potential. Raphael Academy 500 Soraparu St., New Orleans 504.524.5955 raphaelacademy.org Educating special needs students, in 5th through 12th grades, and offering an adult day program for individuals 18 years and older. Harch Hyperbaric Oxygen Therapy Family Physicians Center 5216 Lapalco Blvd., Marrero 504.309.4948 hbot.com Pediatric brain injury, cerebral palsy, ADD, ADHD, autism, post-concussion syndrome, learning disorders, near drowning, crush injuries, mitochondrial disorder. SPECIAL NEEDS For additional information on speech/language pathology and audiology service providers, and to search locally, visit the American SpeechLanguage-Hearing Association at asha.org/ findpro. For additional information on speech/language pathology and audiology, as well as links to other information sites, visit the Louisiana Speech-Language-Hearing Association at lsha. org. SUPPORT/THERAPY The Autism Center at Children’s Hospital 935 Calhoun St., New Orleans 504.896.7272 chnola.org/autism Providing comprehensive, evidence-based assessments and treatments for children with autism spectrum disorders. trying to get your message out? you could try wishing on some flower petals... or you could call nola baby & family and reach everyone that matters! Autism Society of Greater New Orleans 504.464.5733 asgno.org ASGNO empowers, educates, and supports individuals affected by autism through educational opportunities, information and referral services, and support services. Crane Rehab Center LLC – Pediatrics 8300 Earhart Blvd., Suite 100, New Orleans 504.866.6990 cranerehab.com For nearly 20 years, Crane Rehab Center – Pediatrics has provided children and families with comprehensive, evidence-based, highquality, physical, occupational and speech therapy, and ABA services. Down Syndrome Association of Greater New Orleans 504.259.6201 dsagno.org Raising awareness about the ability of individuals with Down syndrome, providing information to parents, and sponsoring educational/social events. Family Behavioral Health Centers 2901 N. Interstate 10 Service Road, Suite 300, Metairie 504.780.1702 145 Robert E. Lee Blvd., Suite 300, New Orleans 504.309.4924 familybehavioralhealthcenter.com A multidisciplinary team approach (e.g., psychologist, speech language pathologist, and/or academic consultant) working with the child and/or family to create an individually tailored treatment plan. Gulfsouth Autism Center 7252 Lakeshore Drive, New Orleans 504.323.3450 gulfsouthautismcenter.com Providing comprehensive treatment for children with autism spectrum disorders. Our early intervention program incorporates oneon-one ABA services with group speech and occupational therapy. LSUHSC Child & Family Counseling Clinic 504.556.3451 alliedhealth.lsuhsc.edu/clinics/cfccclinic.aspx The LSUHSC Child & Family Counseling Clinic is an outpatient mental health clinic designed to provide mental health services to children, adolescents, and their families providing individual, group, and family services. Therapeutic Learning Center 3329 Metairie Road, Metairie 504.565.7300 tlcnola.com TLC is a private, pediatric occupational therapy clinic that offers handwriting clinics, picky eaters club, pre-k prep, music therapy, and much more. Tulane Center for Autism and Related Disorders (T-CARD) 131 S. Robertson St., New Orleans 504.988.3533 medicine.tulane.edu/tcard The program provides interdisciplinary, diagnostic evaluations for children. It will also offer treatment services using ABA approaches in the future. 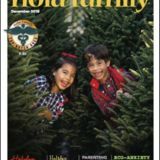 To help your children get into the spirit of altruism and being empathetic, allow them to have meaningful interactions with those who are less fortunate. Please note that these organizations often have minimum age requirements for volunteers, so call or check their websites first. Volunteers help build homes for those in need and must be at least 16 years old. Visit habitat-nola.org/volunteer or call 504.861.4121.
click on “find a facility” to look for one that’s convenient to you, and then call the Activities Director to see if its volunteer program will work for you and your family. Families with children as young as 8 or 9 can help serve meals to those seeking emergency overnight shelter and job placement help. Visit neworleansmission.org/volunteer/volunteertoday. Grow Dat Youth Farm Volunteers must be at least 10 years old to help with farm tasks. Visit growdatyouthfarm.org/ volunteer or email Farm Manager Leo Gorman at leo@growdatyouthfarm.org. Animal Rescue New Orleans Volunteers must be at least 14 years old to help with cleaning cages and walking dogs. Visit animalrescueneworleans.org/volunteer or email volunteer@animalrescueneworleans.org. Catholic Charities – Archdiocese of New Orleans Volunteers can receive credit for school service requirements. Visit ccano.org/serve or contact Shannon Murphy at 504.310.6962 or smurphy@ccano.org. A coalition of Catholic and other faith-based organizations serving the Canal Street corridor, the Rebuilt Center has opportunities for families to help serve lunchtime meals on weekdays. To volunteer, visit stjosephchurch-no.org/volunteer/. Second Harvest Food Bank Children as young as 9 can help sort and salvage food donations in the warehouse, though volunteers ages 9-12 must be accompanied by an adult. Visit no-hunger.org/volunteer or call 504.734.1322 for more information. Trinity Loaves and Fishes This outreach program through Trinity Episcopal Church feeds more than 2,000 people monthly, delivering meals throughout the New Orleans area. Volunteers can help prepare meals. Visit trinitynola.com/tlf or contact Scott Webster at 504.418.1613 or tlfcoordinator@trinitynola.com for more information. Volunteers as young as 12 can help clean cages and care for animals. Email volunteer@la-spca.org or call 504.368.5191, ext. 142, for more information. 5 Must-knows for Swimming Success this Summer 1 Overnight and Day Camps Camps almost always require campers to pass a swim test in order to participate in water activities. Parents often assume their child is a better swimmer than they really are, and then both child and parent are surprised and disappointed to discover they will be restricted from certain camp activities or pool areas. Don’t assume what your child can do. Instead, find out your child’s true skill level before camp begins. When your child takes lessons with qualified instructors, they’ll evaluate your child’s current capabilities, as well as what they need to work on in order to pass those swim tests. Pro Tip: Check with your camp early about their swim skill requirements. 2 House Pools, But Your Rules Make all pool rules consistent, and talk to your child about them. Good instructors always incorporate safety rules into lessons (and teach the parents about pool safety as well), but it’s up to parents to reinforce them beyond the swim school. Make sure your child follows your safety rules at friends’ pools, as well. 3 Community Pools and Bodies of Water Taking swim lessons before swim season increases children’s confidence (and yours as well). We all want swimming to be fun and safe! With all the new experiences they’ll have at camp and public pools such as NORD, swim lessons are invaluable in making the water portion of their summer experience the best ever. 4 Emergency Training Talk to your child about an action plan in case of a swimming emergency. If they fall in the water, they should know to swim to the side of the pool if possible. If their friend falls into the water, they should know to find a life preserver to throw or a long noodle to reach them after calling an adult for help — “reach or throw, don’t go!” Although discussing possible emergencies with your child is no bag of laughs, it will make them better prepared for the unexpected. 5 Accidents DON’T HAVE to Happen Simply put, swim accidents are preventable with adult supervision and swim lessons. Yes, your child must know how to swim. And although you might think that because your child knows how to swim, she’s good to go, kids still need to be well-supervised while swimming or around pools (or even floating down the lazy river at Audubon Zoo). Pro tip: For at-home swim parties, hire a lifeguard. That way, adults can relax and enjoy and know everyone is safe! Sports & Recreation means kids of all ages can participate at the appropriate level for their development. Junior Olympic Training Facility offering gymnastics, tumbling, and cheerleading for boys and girls from beginners to competitive teams. We also offer birthday parties and camps. NOLA Gymnastics LLC 1725 Dufossat Street (corner of Danneel Street), Isidore Newman School, New Orleans 504.782.6462 nolagymnastics.com I FLIP UPTOWN. Preschool to junior olympic artistic and acrobatic teams, plus summer camps. Gretchen Schultz, owner. 5342 St. Charles Ave., New Orleans 3747 W. Esplanade Ave., Metairie 504.897.0143 (New Orleans), 504.887.5158 (Metairie) nojcc.org Stay cool in the JCC pools this summer. Adult lap swimming and lessons for all ages and abilities are available at both JCC locations. Metairie has seasonal swimming; Uptownâ&#x20AC;&#x2122;s heated pools offers year-round indoor swim lessons and outdoor adult lap swimming. Love Swimming 5221 S. Front St., New Orleans 504.891.4662 loveswimming.com Year-round, Uptown swim school offers exceptional lessons from ages 6 months to adult in warm, salt water pools. Love Swimming makes effective lessons fun. FACILITIES Playmakers Indoor South 6124 Jefferson Hwy. Harahan 504.305.6078 playmakersindoor.com/locations/southshore Playmakers Indoor is a state-of-the-art indoor turf facility located in Harahan offering youth flag football and soccer, basketball court and turf field rentals, tots sports classes, parties, and camps. Offering fitness and fun for the entire family. Free group exercises, monthly contracts, babysitting, and convenient locations in Uptown and Metairie. Ochsner Fitness Center (formerly Elmwood Fitness Center) 1200 S. Clearview Parkway, Suite 1200, Harahan 504.733.1600 ochsnerfitness.com More than 150 group exercise classes per week, including daily virtual fitness classes. Personal training, indoor and outdoor pools, basketball courts, childcare, and more. Non-profitS Children’s Special Health Services is a program of services for children and youths who have special health care needs and meet financial guidelines. Administered by the Louisiana Department of Health and Hospitals, Office of Public Health, 504.599.0100. EarlySteps is Louisiana’s early intervention program for newborns to age 3 who have a medical condition likely to result in a developmental delay or who have developmental delays. Children with delays in cognitive, motor, vision, hearing, communication, social-emotional, or adaptive development may be eligible for services. Services are designed to improve the family’s capacity to enhance a child’s development. These services are provided in the child’s natural environment, such as the home or childcare setting. Parents may start their inquiry by contacting their System Point of Entry Office, 504.595.3408 (for the greater New Orleans area). in Orleans, Plaquemines, and St. Bernard parishes; Families Helping Families of Jefferson (504.888.9111, fhfjefferson.org) serves Jefferson Parish; and, Northshore Families Helping Families (985.875.0511, fhfnorthshore.org) serves St. Tammany, Washington, Tangipahoa, St. Helena, and Livingston parishes. The Louisiana Developmental Disabilities Council comprises representatives from every region of the state who advocate for community services and support sought by individuals with developmental disabilities and their families. Additionally, the council strives to increase the availability of support and to rebalance Louisiana’s resources to better meet the needs of its citizens with disabilities and their families, 800.450.8108, or laddc.org. Festivals Tennessee Williams/New Orleans Literary Festival March 27-31, 2019 Throughout the French Quarter, New Orleans tennesseewilliams.net Literature, theater, and even a “Stella” shouting contest. Louisiana Crawfish Festival March 21-24, 2019 Frederick J. Sigur Civic Center, 8245 W. Judge Perez Drive, Chalmette louisianacrawfishfestival.com Featuring food, including lots of crawfish, music, carnival rides, and more. $5 general admission. Hogs for the Cause March 29-30, 2019 University of New Orleans, Lakefront Arena Grounds hogsforthecause.org The barbecue festival is full of music, local beer, and fundraising. Both New Orleans musicians and national musical acts will keep you dancing to whet your appetite for all of the food options. Free admission for kids 10 and younger. Big Bass Rodeo and Fishtival March 30, 2019 New Orleans City Park neworleanscitypark.com/big-bass-fishingrodeo-and-fishtival One of the city’s most cherished fishing rodeos includes a category for Junior Anglers (ages 12 and younger), with an added division, Boats on the Bayou, and a new high school competition, Battle for the Bass. French Quarter Festival April 11-14, 2019 Throughout the French Quarter, New Orleans fqfi.org Come hear more than 150 musical performances on 20-plus stages around the Quarter. Free admission. Ponchatoula Strawberry Festival April 12-14, 2019 Memorial Park, 301 N. Sixth St., Ponchatoula lastrawberryfestival.com This family-friendly festival, hosted by the “Strawberry Capital of the World,” has great food, entertainment, games – including a strawberry-eating contest – and more. Free admission. Jazz Fest features two weekends of music, crafts, and incredible food. Mid-City Bayou Boogaloo May 17-19, 2019 On the banks of Bayou St. John, near the intersection of Orleans Avenue and N. Jefferson Davis Parkway, New Orleans thebayouboogaloo.com Festival celebrating New Orleans community, music, and food. Free admission. The festival encompasses 25 city blocks and features six stages with performances by national entertainers, along with some of Louisiana’s finest and favorites. Free admission. Beignet Fest Oct. 5, 2019 Festival Grounds, New Orleans City Park beignetfest.com Celebrating New Orleans’ most iconic dessert: the beignet – from traditional sweet treats to savory delicacies. Plus local music and a Kid’s Village. Proceeds will benefit the Tres Doux Foundation. Eat, drink, dance, and don’t miss the baklava sundae at Greece on the Bayou. The annual festival celebrates southern soul, with local and international blues and R&B talent, plus great local BBQ. Free admission. Creole Tomato Festival June 8-9, 2019 French Market, New Orleans frenchmarket.org Bountiful fresh Creole tomatoes for sale, cooking demonstrations, food booths, live music, children’s activities, and even a Creole Tomato-eating contest. Free admission. Satchmo Summerfest Aug. 2-4, 2019 Throughout the French Quarter, New Orleans fqfi.org Dedicated to Louis “Satchmo” Armstrong and featuring local music with a focus on contemporary and traditional jazz and brass bands. General admission $5. Oak Street Po-Boy Festival 2019 date TBA Oak Street at S. Carrollton Avenue, New Orleans poboyfest.com This event features some of the finest restaurants, artists, and musicians in the Crescent City, all coming together in appreciation of one of New Orleans most distinct and delicious creations – the po-boy sandwich. Free admission. Renaissance Festival Nov. 2-3, 9-10, 16-17, 23-24, and 29-30; and, Dec. 1 and 7-8, 2019 46468 River Road, Hammond larf.org A festival, theme park, theatre, holiday shopping destination, and educational experience all rolled into one great adventure. Your family's guide to everything New Orleans!